As you have read in the previous sections of this course, considerable breakthroughs were made in Scientology on the subject of organizing. However, these are but a small portion of the natural laws of organization discovered and developed in Scientology during research into and discovery of the fundamental axioms of all life. With the statement of these axioms—the basics of existence itself—light was cast upon all fields. Scientology makes the able more able. Each of its organizations has the purpose to deliver this technology to the individuals of its community so they become more able, improve their lives and the lives of those around them. As a result, the individual can accomplish his personal goals, the community as a whole grows and a new civilization free from the insanity, conflict and strife that has plagued man for millennia will be created. Ultimately, this is the aim of Scientology. To make it possible to maximally service individuals and its community, it is necessary for a Scientology organization to be highly organized and efficient. Existing organizational charts were typically only command charts that showed the direction of orders from the top down, and were far from usable for the unique purposes of a Scientology organization. Needed was an organizational pattern that primarily revolved around the delivery of Scientology services and provided the other functions necessary to not only continue the organization’s existence but enable it to effortlessly expand while achieving its aims. Hence, it was necessary to formulate an organizing board particularly for Scientology organizations. Each area of a Scientology organization functions in one of two ways. Either it delivers the services the organization offers, such as its many courses, or it assists these areas by hiring and placing personnel, paying the organization’s bills, caring for its staff, informing public of the services the organization offers and many, many other activities. All of the portions of a Scientology organization operate together as a unified and dedicated whole to accomplish the organization’s purpose. And it is the organizing board which provides it with the vital organizational foundation to bring about success. Though originally developed for use by Scientology organizations, the beauty of this organizing board is its flexibility in application. Based as it is on the laws of life themselves, it can be applied to any area of endeavor and by any organization, no matter its function or size; furthermore, it can even be used by an individual to organize his own life and improve his own existence. The organizing board is divided into seven distinct areas called divisions. These are numbered 1 through 7. Each one performs the functions necessary to produce a product specific to that division. For any organization to be successful, all of the activities covered by these division names must be performed. These are: Executive, Communications, Dissemination (promoting and marketing of the organization’s services and products), Treasury, Production, Qualifications (ensuring the quality of the organization’s services and products), and Public (informing new public of the organization’s services and products). An organization lacking one or more of these divisions will fail. 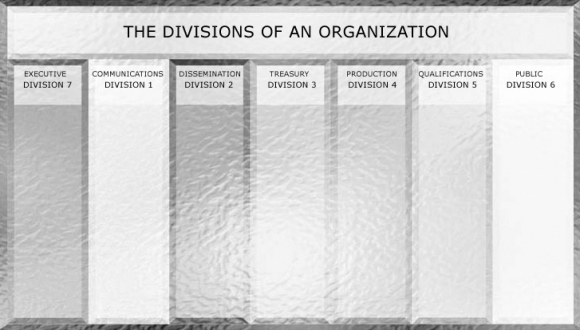 Although the seven division organizing board seems to have a number of divisions that would fit only a large group, it does, as mentioned, fit any organization of any size. The problem presented in deriving this board was how to overcome continual organizational changes because of expansion and how to apply it to organizations of different sizes. Thus this board goes from one person to thousands without change. Just fewer or more posts are occupied. That is the only change. Unique to this organizing board is that it is entered from the left and proceeds to the right, starting with Division 1 and moving on through the divisions to Division 6, and then out. An individual or particle does not flow through Division 7—this division coordinates the activities of the rest of the organization and sees that it properly functions to accomplish its purpose. This organizing board would ideally be mounted on a large cylinder to show that it flows in a continuous circle with Division 7 meeting Division 1. To emphasize this fact, Division 7 is placed before the rest of the divisions on the board. Divisions 1 through 7 are not arbitrarily arranged but describe a sequence known as the cycle of production. A fundamental law of this universe is that for any cycle of action to successfully complete, it must go through these exact seven main stages. In other words, for an organization or company to produce a high-quality product or service, it has to have all seven divisions properly operating. Down through the ages, innumerable civilizations, governments and groups fell prey to various ills and vanished from the face of the earth. It was a lack of one or more of these seven divisions that brought about these failures. The direct application of this org board to an organization of any size or an individual’s life is immediately evident upon inspection of it. For instance, you would have to be in Communication with people about what you are doing and have your communication lines established. Dissemination would involve telling people what you are producing, and promoting this. You must have the physical materials to produce your product, which is Treasury. This includes funds to buy the materials and methods of purchasing them, as well as care for your assets. Then there is Production of the product—the service being provided or item being produced. And when the product is complete, Qualifications reviews it to make sure it meets the requirements of a product and if not, straightens out those involved so the product is valuable and can be exchanged. Qualifications also includes the furthering of your own education and training and that of an organization’s personnel. Once the product is qualified, the Public Division distributes it, creates new public who can obtain it and makes you and your products known to and desired by them. Establishing goals and planning for the future is cared for by the Executive Division, which also keeps things operating and solves the various problems and bugs that may occur. The functions performed by each division are further subdivided into departments, usually three in number, making twenty-one in total. Each department has a specific product or products which, when added together, result in the overall product of the division. In a Communications Division, for example, the final product is effective, productive and ethical personnel. The first department is the Department of Routing and Personnel, which has a product of effective personnel posted and hatted. Some functions of this department are: receives individuals entering the organization and routes them to the correct terminal in the organization; hires personnel; determines the proper utilization of new staff and correctly places them to assist the organization’s expansion; and sees that the organization’s staff know their duties. 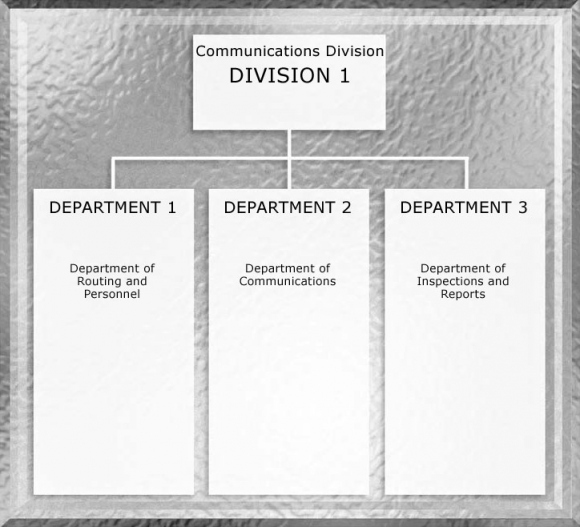 The Department of Communications is fully responsible for the communications into and out of the organization, as well as those which flow between organizational staff members. Its product is communications easily accepted and swiftly delivered. It answers the phones, swiftly directs calls to the correct terminal; receives incoming mail and swiftly distributes it to the staff throughout the organization; sees to it that the organization is communicating to its public in volume; establishes the organization’s communications systems so its staff and executives can send and receive the communications necessary for the organization to successfully operate; and swiftly routes the internal despatches amongst the staff. The Department of Inspections and Reports, with the product of ethical, producing personnel, is the third department. It inspects ongoing organizational projects and reports on their status to executives so, where needed, action can be taken to rectify any shortcomings; it collects and graphs the organization’s statistics so these can be inspected and analyzed by its executives to improve production and effectiveness; and maintains a high level of ethical behavior in the organization. Every individual has his twenty-one department org board. The degree to which the functions of these departments are being performed regulates his survival and success. Applying the organizing board to one’s life is quite simple. By taking up the functions done by one department and comparing these to one’s own activities, he can determine if these are being done or are missing. Continuing in this fashion for the remaining departments enables one to assess what functions or even departments are missing on his own org board. He can then take action to remedy these deficiencies and improve his life. A simplified version of the Scientology org board follows. It describes the functions of the divisions as they can be applied by any individual, organization or group. literally, caused to fall on or over any object or in some particular direction. Used figuratively to mean explained or shown more clearly, resulting in increased understanding. the plural form of millennium, a period of 1,000 years. in a way that is maximal, the highest or greatest possible. became harmed or affected by; became vulnerable to or overcome by. Prey means something that is defenseless, especially in the face of attack, a victim. to make, put or set right; remedy; correct.